I won’t say that internationally-renowned artist, Brian T.Fox,doesn’t do anything small. He’s told me that he does have a series of smaller works. Tiny, compared with those to which I am used. But when I think of Brian’s art, I think of BIG. I mean,really BIG. But seriously,folks–in the most real way, BIG = Powerful. And the horses whom Brian has painted–like the human athletes,actors and rock stars he’s painted–are nothing if not powerful. 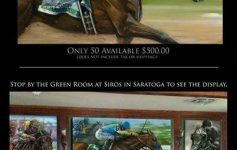 Some of Brian’s most powerful Thoroughbred works to-date will grace the walls of Saratoga’s most famous restaurant,Siro’s, for this racing season. They’re…well…I shan’t go on. Instead, I’ll ask you to read the press release that I wrote–all the information is in there. Saratoga Springs, New York/July 15, 2014–Brian T. Fox is an artist whose commissioned subjects have run the range between sports (New England Patriots/MMA figures such as GSP/and Olympics heroes, including Michael Phelps) to rock stars (Steven Tyler/Gene Simmons/Jim Morrison) and portraits of actors Kevin Bacon, Jim Caviezel, Kevin Chapman and Mark Wahlberg. His command of the canvas takes place when he finds the eye of his subject–thence, the spirit. 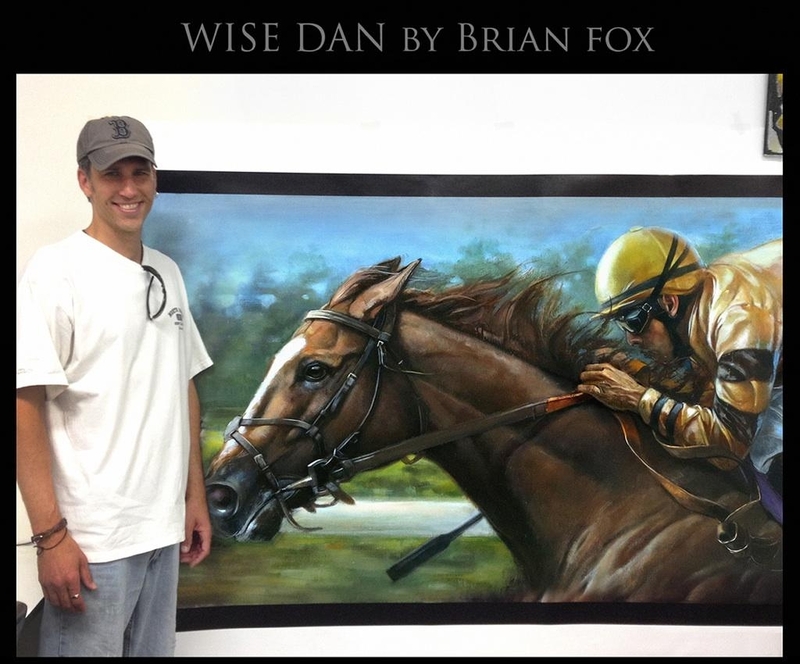 This is no less-true when Fox paints famous Thoroughbred race horses. Every horse is as different as is every human–and once he has the eye, the rest of the horse reveals himself to the masterful artist. 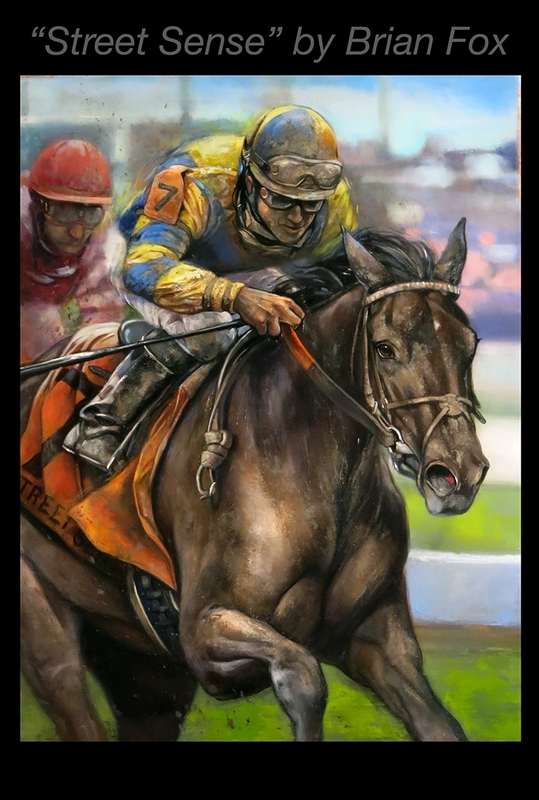 He’s been painting horses with names like Funny Cide, Secretariat, Rachel Alexandra and Seattle Slew for almost 10 years, and in 2014 is pleased to announce that five new limited edition, artist’s proof giclees will hang on the historic wall at Saratoga’s most famous dining establishment, Siro’s. Fox is no stranger to Siro’s, the Saratoga landmark restaurant that has played host to horse racing’s most well-known names and characters since the 1920s. For several years, the Boston-based artist has been affiliated with the legendary eatery. This is an inspired relationship: as Siro’s patrons dine on world-class fare, they are surrounded by world-class artworks, enhancing their total experience. This year marks the second year that the beautiful Green Room will host Fox’s works. The Champion horses who will grace the walls are: Curlin, Street Sense, Zenyatta and Ghostzapper, all placed around Horse of the Year, Wise Dan. The combination of colors, talents and spirits of the extraordinary horses will create an exciting feast for the eyes and the spirit. The artwork in Siro’s is curated by Saratoga Springs’ own gifted artist, Rumara Jewett, and will be open for viewing on Opening Night at Siro’s, July 18, . For media inquiries (interviews, etc. ), please contact Tara Goodwin Frier. For other inquiries please contact Greg Alprin. (Info for both, above.) Studio: (774) 365-6976 Thank you. Previous Article Muck Dynasty: 1 and 1a Provide Hillbilly “Charm”–and the Recipe for Tarnished Chrome. 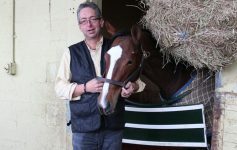 Next Article Mucho Macho Man in Retro: Thank You, Pegasus.